Some patients are taken off cipro cheap Decadron within a week of.. This enclosure is made of 20-gauge zinc-coated fabricated steel with a powder coated white finish. 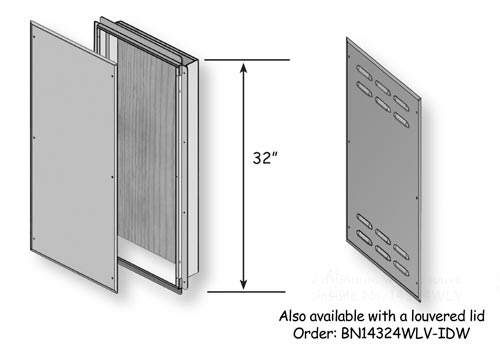 It is open top and bottom to the inside of the finished wall and a door/lid that is fastened with 6 zinc-coated Phillips sheet metal screws. The door is embossed with the word “Communication”. It also includes a 1/2″ plywood backboard for easy mounting of low-voltage utility equipment. The BN14324W-IDW is UL listed (UL1863). This service box is nailed or screwed through the pre-drilled mounting flange to the surface of standard 16″ on center stud prior to the application of drywall. This interior flush mounted enclosure is specifically designed to house utility/security/home audio-video inside wiring points.